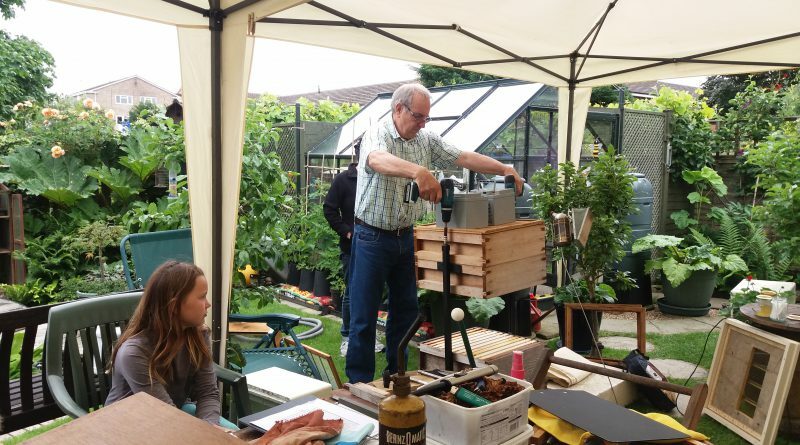 A visit to CRs’ Open Day is like an Aladdin’s Cave of beekeeping equipment, and he didn’t disappoint again this year! Chris welcomed 15 members to his Open Day where we were treated firstly to a demonstration of his hive lifting tool ‘Hive Assist’ (you can watch the video on the SBKA Facebook page) designed to save lifting heavy supers; his Bee-Vac made out of the top of an old vax machine, a brood box and a roof, with carrying straps to carry up ladders and an extra long hose. Chris used this very successfully recently at Denis Keyte’s to ‘hoover up’ a swarm! Everything he makes is from recycled paraphernalia. Then we saw his Hive Measuring Scales – made from pieces of an old tubular garden frame bent to shape, suspending a set of scales; his warming cabinet from a wooden box filled around the sides with thermostatically controlled warming cables; discussed his method of uncapping frames, and extraction; followed by a wax area demonstration where he treats all his wax ready for making candles etc. It started to rain a little later but it didn’t bother us at all. We were sat under the gazebo enjoying tea and cake in a lovely garden overlooking a pond (watching a huge fish ‘Polaris’) chatting about bees and surrounded by bee-keeping gadgetry! What could be better? Thank you Chris and Margaret for a very entertaining afternoon.